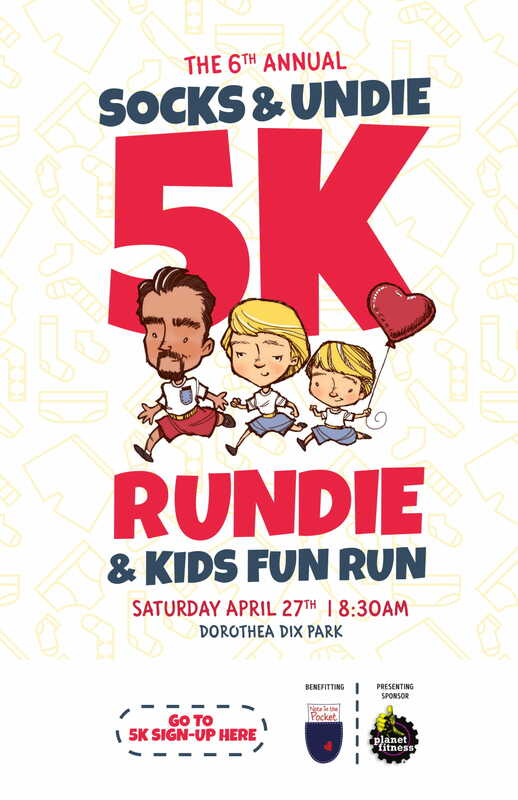 Join HREG at the 6th Annual Socks & Undie 5K Rundie! What are you doing on Saturday, April 27, 2019? We invite you to join us at the Note in the Pocket Sixth Annual Socks & Undie 5K Rundie presented by Planet Fitness! The fun run/walk event takes place at the beautiful Dorothea Dix Park in Raleigh (805 Whiteside Drive) and it is one of our favorite annual events to sponsor financially and participate in, as well. This event really is for the whole family – a kids’ fun run (0.25 mile) also happens at this event and you can register your furry canine friends to join you, too. Just the fact that the event is taking place at Dorothea Dix Park is one of the things we’re most excited about. Described as one of North Carolina’s “most beautiful parks, rich in history and landscape”, the scenery alone will make this a great outing. Race Day Packet Pick-up & Registration will take place at the start/finish of the race from 7-8 a.m. (Or you can pop by Note in the Pocket’s volunteer center on Thursday, April 25, 2019, 4-7 p.m.) Stick around after the race and enjoy music, food, and activities for the whole family! https://runsignup.com/Race/Register/RaceGroup-594107?raceId=27129 to join our team. You’ll need to register then select “Hillman Real Estate Group” as your team. You’ll also get 5% off with this code at checkout: Hillman5off. Can’t make the event but want to support this great cause? Please join us remotely by making a donation at https://runsignup.com/teamhreg. As a non-profit serving the children in Wake County schools, Note in the Pocket started with a simple mission: To Clothe Children in Dignity and Love. Note in the Pocket believes that it is unacceptable that children are limited in their educational and social development because they do not have appropriate clothes for school. In 2018, Note in the Pocket received clothing requests for 4,381 individuals, mostly children, throughout all twelve cities and towns in Wake County. NITP has served nearly 20,000 individuals since receiving our 501C3 status in 2013. Watch this quick video to learn more about Our Story.